My visits to my dad involved a trip across town from Kansas City to Independence. While my routes vary a lot, I often drive on Truman Road. It is just wonderfully urban. I particularly love this corner store East of downtown on Truman Road. 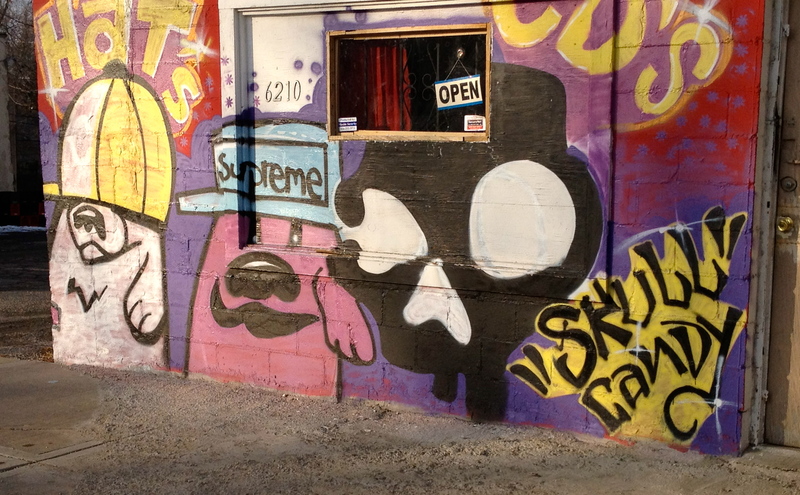 The storefront is covered with cartoon characters. I never could figure out the name of the store, but it appears that it sells hats, CD’s and “skull candy”? Seriously. I don’t know. The owners came outside to see what I was doing, but seemed pleased that I considered their art worthy of attention. These gentlemen were hard at work. They appeared to be having fun as they worked. When they saw me, they waved and let me take their photographs. 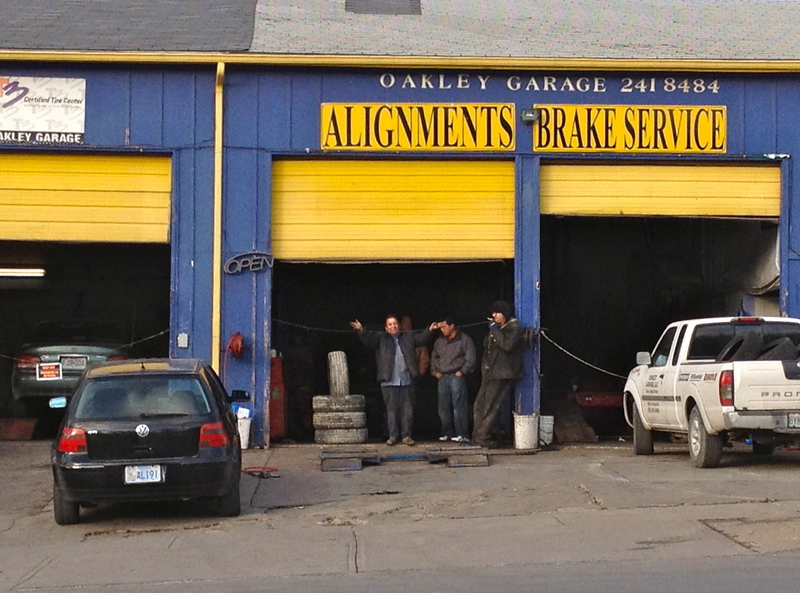 their work stopped for a moment. They were in a good mood and so was I. 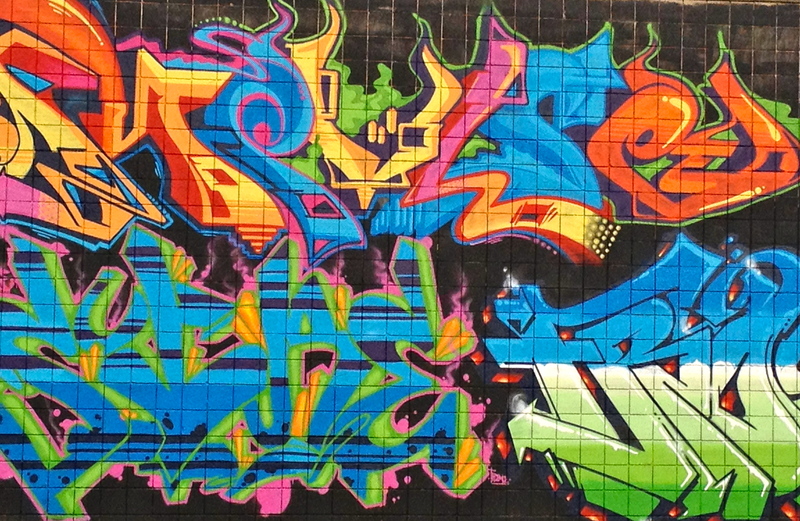 In years past, teenagers snuck out at night with paint brushes and spray cans to create what was generally mediocre, if colorful, graffiti under bridges, on vacant buildings and sometimes the sides of churches and schools. Without question the world of graffiti has changed. 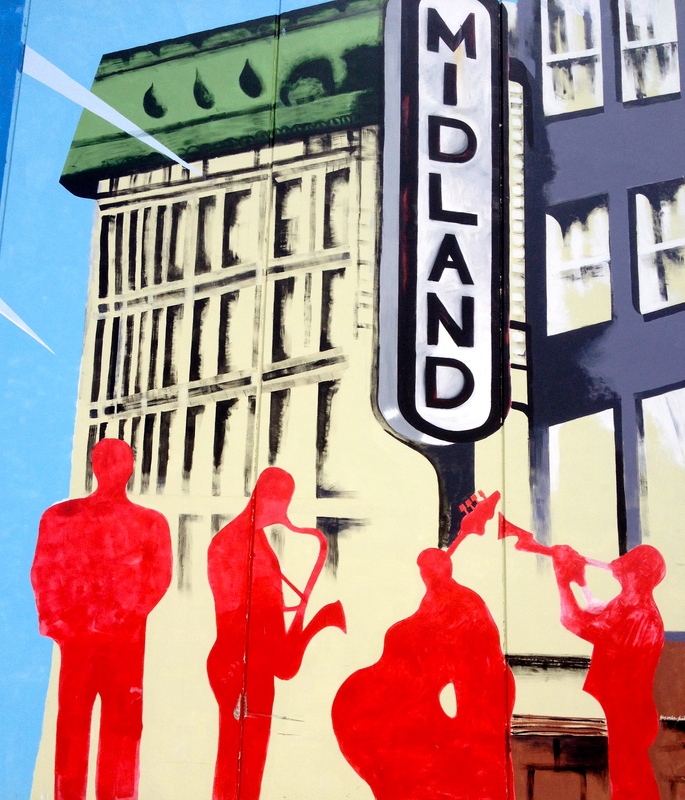 The murals I see on my drives through urban Kansas City are often exquisite works of art that appear to have been the work of artists hired by business owners to create colorful displays on the exteriors of their buildings. Even the texture of the bricks beneath the designs adds to the visual impact. It is, in effect, graffiti “grown up”. When I happen upon a particularly colorful design, I find I alter my route to and from work just to see the art over and over again. I regret only that I am unable to identify the artist so I could praise them by name on this post. 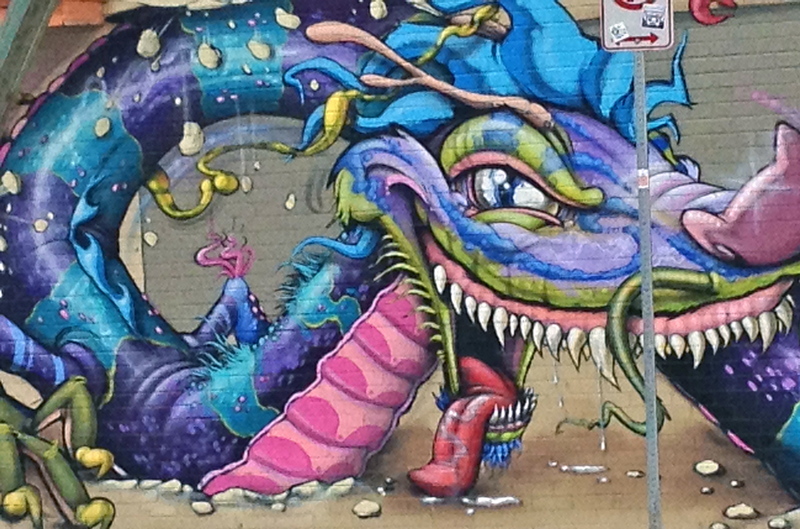 At least I can honor these urban artists by sharing their creative designs with our friends. In Kansas City, at least, art finds its form in these creative, incredibly colorful, urban designs. Aren’t we lucky! A funny thing happened in Kansas City when Crosby Kemper, III assumed leadership of the Kansas City Public Library. The sleepy, somewhat deteriorated library system was reinvigorated. The Central Library at 311 E. 12th Street, across from the Jackson County Courthouse, closed. 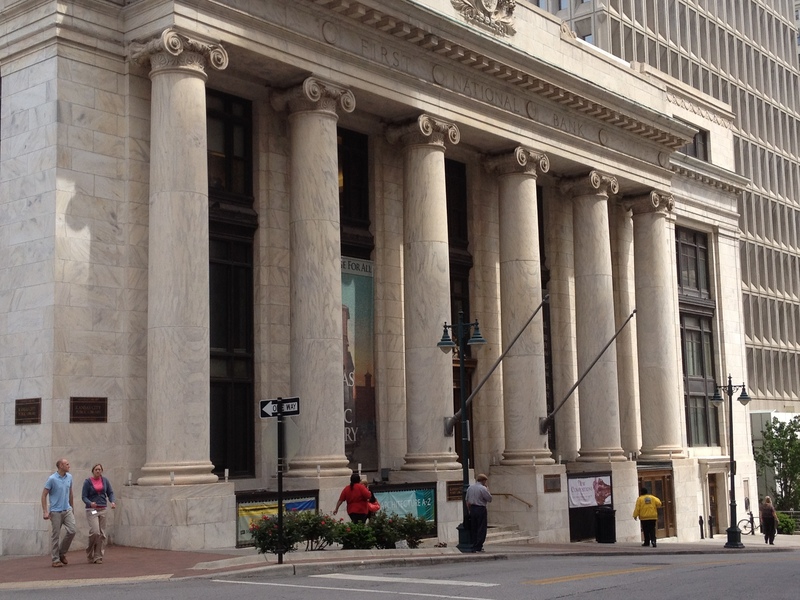 In its place, thanks to hard work, creative minds, and public and private funds, the Central Library reopened in the historic First National Bank Building at 10th and Baltimore, in the heart of Kansas City. The exterior of the library complex hints at the extraordinary nature of the library. The murals on the wall are truly elegant. The book spines that dominate the separate library parking lot remind us of the fundamental purpose of the library–to instill enthusiasm in books and knowledge. But it also invokes a sense of fun, excitement and hints at the passion of the leadership of the library. Seriously, Tao Te Ching? This isn’t just a library for children’s books. But neither is it a library that ever, ever minimizes the importance of nurturing young minds. 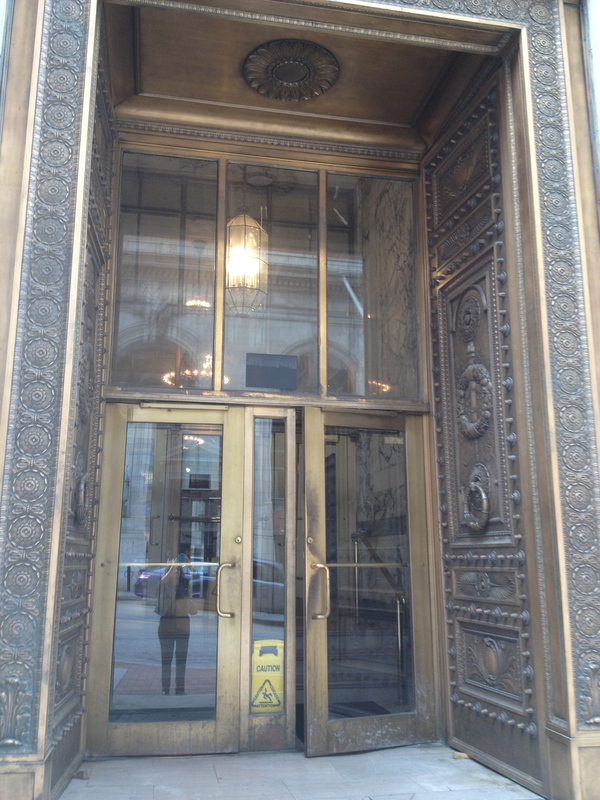 The bronze doors are tall and stately, reflecting the significance of the building and its purpose. The moldings surrounding the doorway are works of art in and of themselves. When Kemper accepted the position as the Executive Director of the 10 libraries that compose the Kansas City Public Library, things immediately began to change. Educated at Yale University, his career has included working as a teacher in China, as the Executive Director of the British American Education Foundation in New York, and as President of UMB-St. Louis and CEO of UMB Financial Corporation at United Missouri Bank. Not a likely background for a librarian but it certainly works, and more so. He is clearly a man with a mission. You may ask yourself what has changed under his leadership. The answer, is almost everything, inside and out! The Central Library is light and airy. 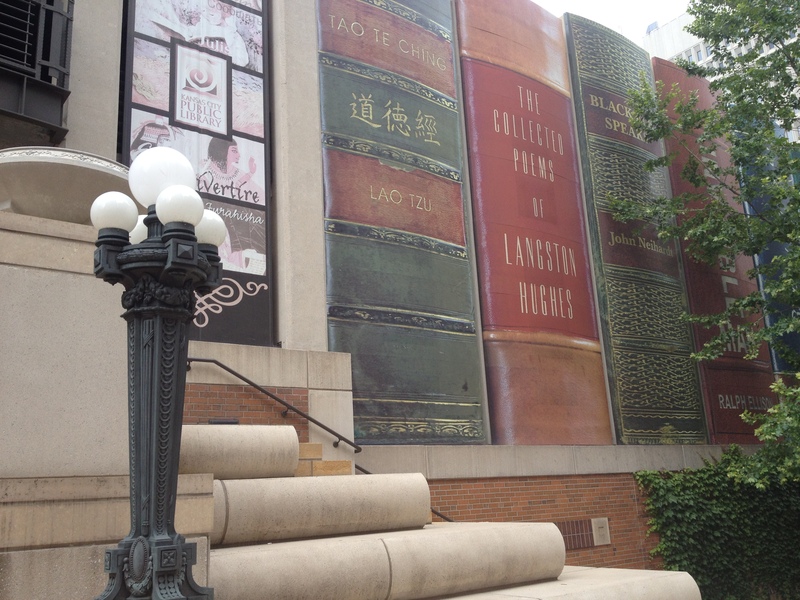 In addition to a first class library, with the support of the top quality leadership of the Kansas City Public Library Foundation he has implemented a schedule of events and activities that are world-class. In conjunction with Kauffman Center for the Performing Arts, Kauffman Foundation, the Stowers Institute, the Nelson-Atkins Museum, the University of Missouri, Park University and others, the library offers concerts, lectures and meetings. These events are held at the Central and Plaza libraries, at the Kauffman Center for the Performing Arts and elsewhere. He hosts authors and statesmen. He personally shares the stage with actors portraying historical figures and “interviews” them to give the audience a sense of their personalities. The library has a high quality film vault and has regular screenings of classic movies. Spread throughout the 10 libraries in the system, are book clubs, events for children and teens, classes on finance, computer basics, exercise classes, genealogy. The list goes on and on and on, but you get the point. While all of the library locations offer a range of programs, the Central Library is generally the location of the major academic and current events lectures. 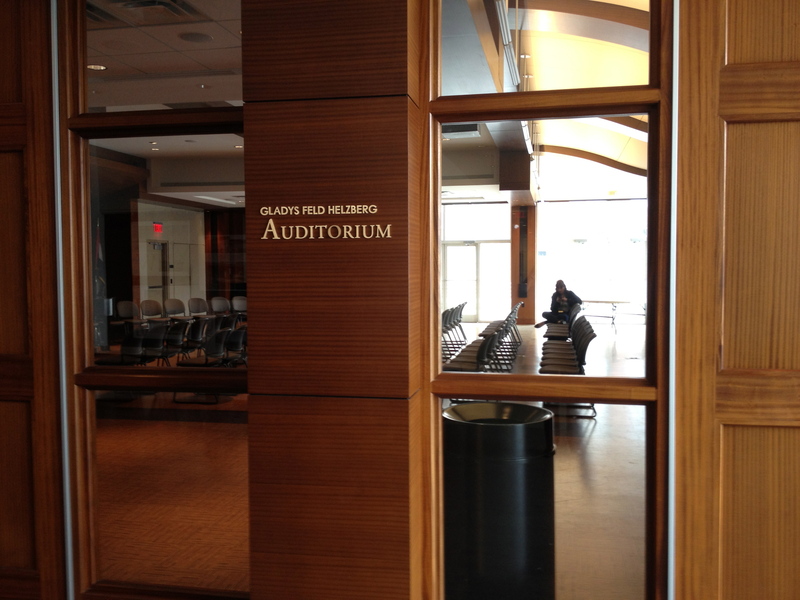 Programs in the Gladys Feld Helzberg Auditorium on the 5th Floor are generally free to the public, but reservations are requested or required. 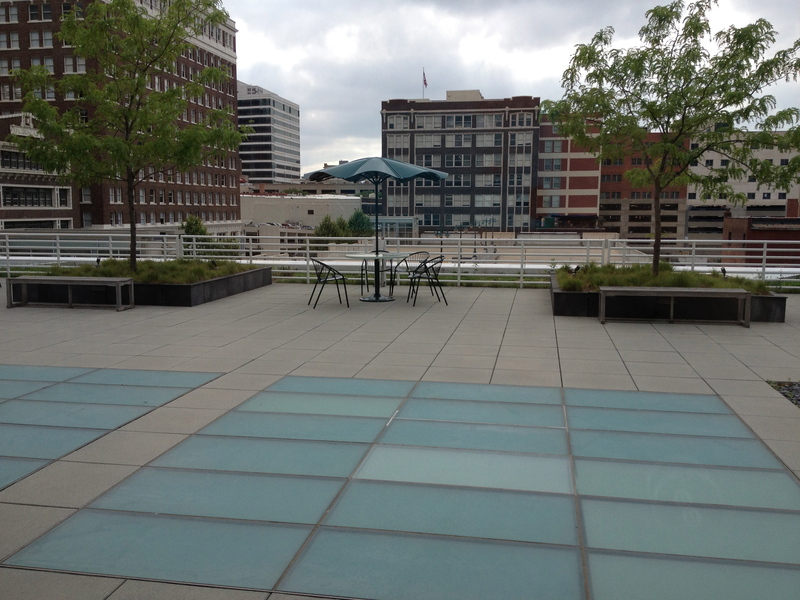 In mild weather, visitors enjoy the patio adjacent to the Auditorium. Year round the rooftop view is wonderful. 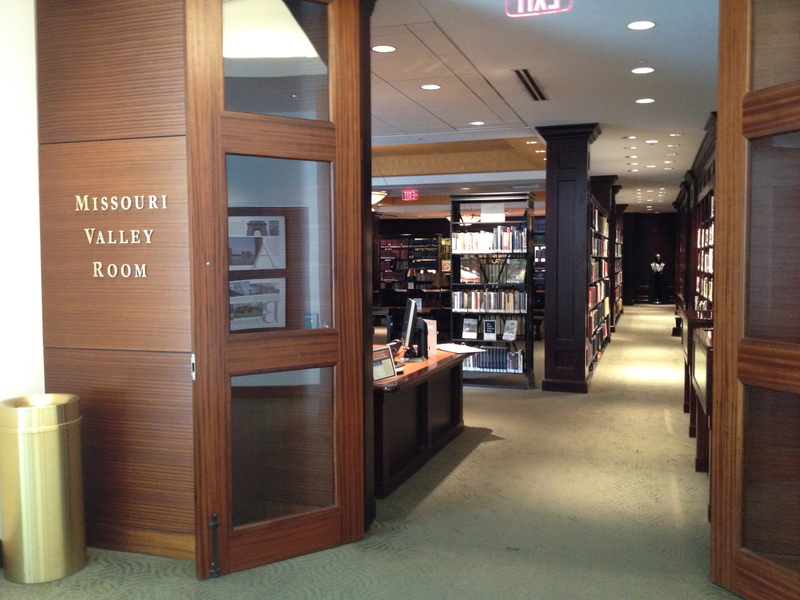 Genealogists are welcome at the Missouri Valley Room also on the 5th floor. There is knowledgable reference librarian on hand. While Kemper gets high marks for his leadership, his passion and vision are shared by the library’s board of directors, led by Jonathan Kemper, and by library’s foundation. His staff and administrators are also knowledgeable, helpful and enthusiastic. If you live in Kansas City, what are you waiting for? It is an easy building to find. 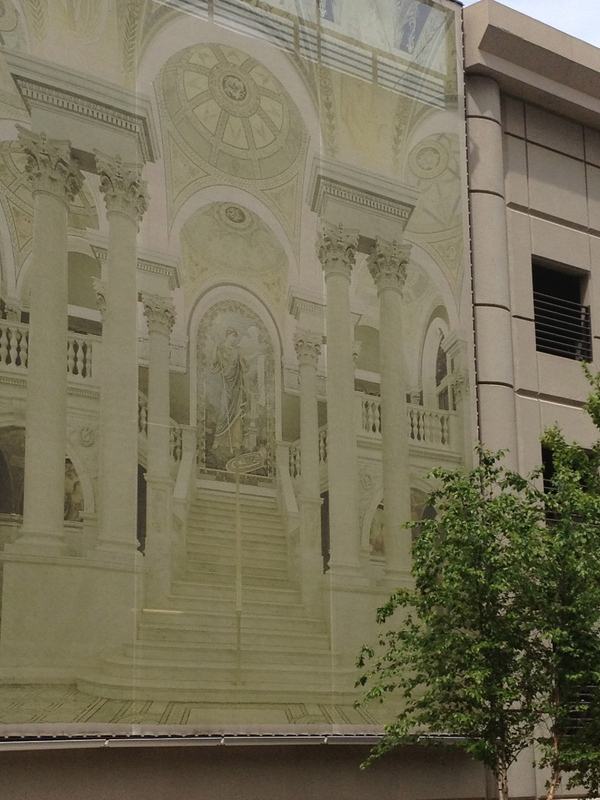 Just look for the pillars, the elegant exterior murals and you are there. If you don’t, it is worth the trip. It is well worth the visit. Happy reading!